I, like many of you, have used a lot of tricks for splitting up groups. What if we could have kids get into groups with the people they want to play the game with and we try our best to make that happen? Most of the techniques at the top are designed to split up cliques and encourage campers to expand their friend groups. They are designed to push kids outside their comfort zones so they can make new friends. That’s ok, but what if that isn’t the number one goal. At Stomping Ground, the camp I help run, we play an all-camp game every night. The night games often have teams, sometimes all the kids are on one team against some staff playing the bad guys. You can see some of our games in the Free Stuff Section of this site. For us, the goal of the night games is threefold. We want to create larger than life immersive events that kids will remember and talk about. We want to end the day on an epic high note giving all of camp a shared experience. We want to let kids encounter big ideas on their own terms. Not everyone participants in all the games, they can opt out, but the goal is to get as many people at camp thinking in the same direction and have a wild time doing it. 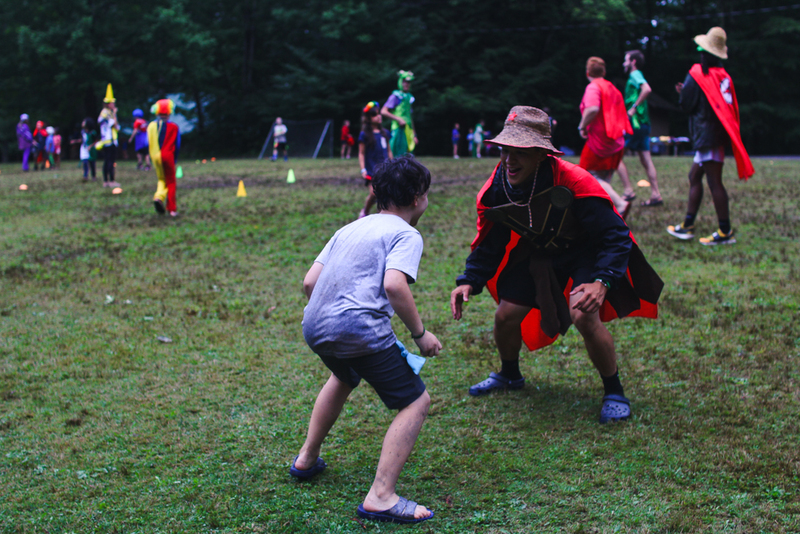 These games, at Stomping Ground, and at many camps, are many kids favorite part of camp. If you noticed, for us pushing kids outside their comfort zones or getting them to make new friends during the games are not our highest priorities. This doesn’t mean we don’t hope kids will make friends, but it means we aren’t prioritizing that during these games. We prioritize that at other times. If that is the case, that we care more about kids loving the experience than pushing making new friends, during the game, than what should we do about making teams? Side note, if the kids are having the best time ever they tend to also love making new friends. That the making new friends part comes naturally when they are having an awesome time. What if we just let the kids decide? We have tried this and the hard part is they tend to make teams that aren’t very fair. I think if given enough time one of the more outspoken, probably older, kids would speak up and explain that the teams aren’t fair and that makes the game less fun, but we haven’t run that experiment. What if we mostly let the kids decided, but we play the role of that older kid? What we tend to do is explain the game. Then explain the number of teams and have kids clump together based on who they would like to be with. Then one of our game makers go around and send groups of kids evenly to teams. This let’s us have some control over balancing teams, and let’s kids play the game with the people they want to play with. We find when teams are mostly even and kids are with the people they want to be with the games are dramatically more fun. This is more art than science. As the facilitator, like always, we need to be on the lookout for kids possibily being left out or just not actively included. We have added in recent years the option to instead of choosing your friends you can choose the color or team you want to be on. We do this by sending team captains to four corners of the area and telling kids if they want to choose the color they are on go to the color and if they don’t care please stay in the middle so we can make fair teams. We have found the younger kids tend to be more color-focused and the older kids don’t care about that, but want to make sure they are on the same team as their friends. At the end of the day the question of how we form teams is about why are we playing the game at all? Why should adults decide? Why should kids decide? Why have teams? By pushing ourselves to answer these questions we can more effectively and intentionally accomplish what we are hoping to accomplish. If you love thinking about this kind of thing you will love the All Camp Games Workshop we are running in February. All online. Newer Post"Professional development becomes a way of working and thinking"